Update: The story has been updated since it’s original publication at 5 p.m. Sunday, March 17. East Carolina University Chancellor Cecil Staton announced his resignation Monday, March 18. Carolina Journal had learned Sunday about Staton’s plans to leave the job May 3. He’ll stay until June 30 to advise UNC System Interim President Bill Roper and ECU’s interim chancellor during the transition. 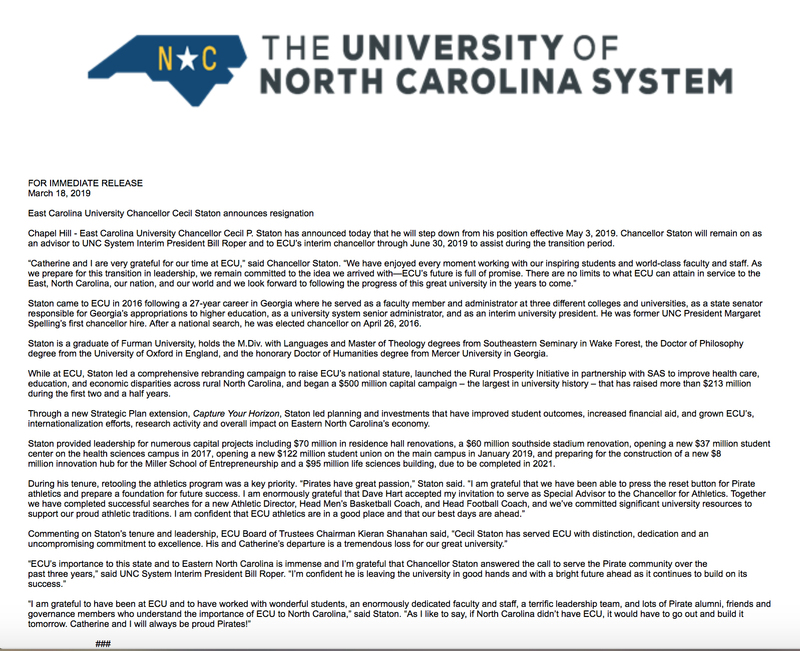 Press release issued March 18, 2019, from UNC System office announcing ECU Chancellor Cecil Staton’s resignation. Staton’s exit follows that of former University of North Carolina System President Margaret Spellings and former UNC-Chapel Hill Chancellor Carol Folt. It also chases news of a shake-up in leadership among ECU’s Board of Trustees, with UNC Board of Governors Chairman Harry Smith denying reappointment to members who support Staton, the Greenville Daily Reflector reported March 17. Staton arrived at ECU in 2016. Spellings’ first appointee for a chancellorship, he was hired amid applause and optimism. Formerly the interim chancellor at Valdosta State University, Staton also served as a senator in Georgia’s state legislature. Staton has taken heat over issues involving ECU athletics and the cost of buying a new chancellor’s residence. Staton inherited the problems and didn’t cause them, multiple sources, including BOG member David Powers, have told CJ. CJ confirmed with sources in November that Staton intended to leave his post Jan. 1, on the heels of Spellings’ Jan. 15 departure. Sources continue to confirm to CJ that Staton has been considering an exit since last year. 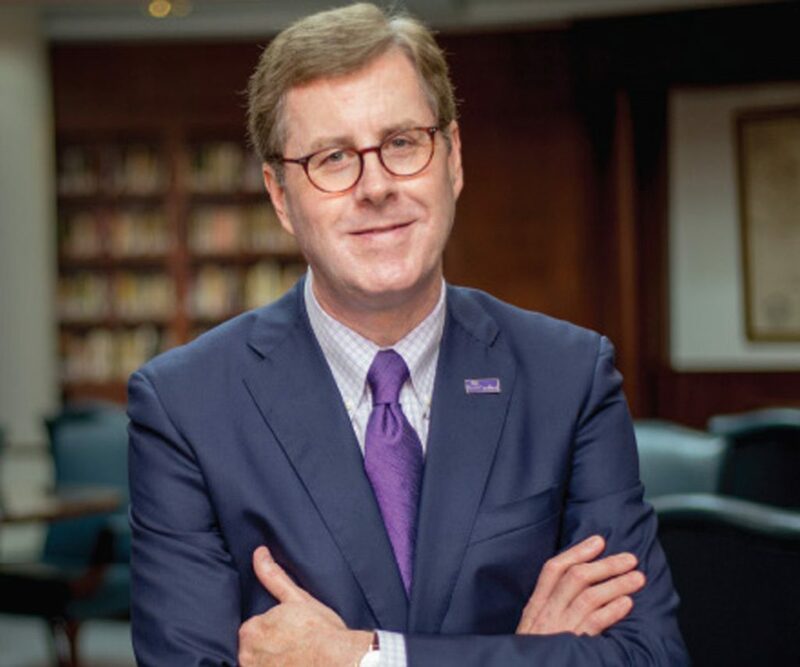 Documents show Smith has long been critical of Staton and that the ECU BOT — and leaders of the Greenville community — have continually lined up in support of the chancellor. On Jan. 8, a group of more than 120 high-profile ECU supporters sent a letter to Spellings, Roper, the UNC Board of Governors, and ECU’s Board of Trustees, asking all to allow Staton “to continue in his position without continued threats” and calling for the release of his recent 360-degree performance review, which contains information about the chancellor’s work and accomplishments since Staton’s hiring. CJ made multiple attempts to see Staton’s 360 review — which Staton was happy to see disclosed — but UNC denied the request, citing a disputed personnel exemption in public records law. Normann told the Daily Reflector, and later CJ, that after a recent closed-session meeting about Staton’s job performance he got an email from Smith indicating he wouldn’t be reappointed to the BOT. “Smith threatened multiple times to replace ECU’s entire board of trustees, because, ‘We couldn’t get out of our own way.’ That’s a quote. And he said it many times,” Normann told CJ. Smith has repeatedly said he and the BOG would never “overrun the trustees” and wouldn’t fire Staton without direction from ECU and Spellings, though “I know that rumor was flying … but that rumor never should’ve gotten any legs, and the world is full of rumors as you know,” Smith told CJ in August. Normann, who was out-of-town Sunday on a hunting trip, took a call from CJ to discuss Staton’s resignation and the future of ECU. If the chancellor’s departure is a way for the university to work better with the board and Smith, then that’s the best decision for ECU, he said. Normann said he doesn’t harbor a grudge and wants the the BOT, BOG, and ECU’s new chancellor to collaborate and succeed. CJ reached out to the UNC System office for comment from Roper and Smith, but received no response by press time.